With the noteable exception of the Goody Bag, a good cake or cupcakes are the biggest draw to any child's birthday party. Natalie always asks, "Will there be cake?" when I tell her we've been invited to a social function. Michaela Byrd talked about purple cupcakes for her birthday party pretty much around the clock last week, so I knew I needed to pull out all the stops and make some fabulous homemade cupcakes for her little Princess Party on a budget. I found Laura's recipe for The Perfect Cake-Mix Cupcakes during a Google search, and it did the trick! The neat thing is that cupcakes can be served at all kinds of occassions...I'm thinkin' up something for Valentine's right now! Keep reading for the recipe I used and to see how I ice mine. Preheat your oven to 350F. Line cupcake tins with paper liners. Follow the instructions on the box, placing the ingredients in a large bowl and using the buttermilk in place of the water specified on the box. Use the amount of vegetable oil that is called for, then add the 4 eggs. Beat with an electric mixer until moistened, about 30 seconds. Increase the speed to high and beat until thick, 2 minutes longer. Fill paper liners two-thirds full. Bake 12 to 20 minutes or until toothpick inserted in middle comes out clean. (I found that 15 minutes usually did the trick) Cool completely before icing. I'm usually running short on time, so I like to start with a canister or two of premade icing, and my box of colored gels from Wilton. The gels are cheap if you hold on to a Michaels/JoAnn/AC Moore/Hobby Lobby coupon. In the long run, I feel like it's worth it to have several different shades to play with. Spoon a big hunk of icing into a bowl (it's always better to do more than you need so you don't have to match colors later). Take a clean toothpick and dab a generous amount of the gel color you've chosen onto the tip. Swirl it onto the top of your icing and then discard the toothpick (I've been told to use a clean toothpick each time I need more gel, or it icks up the gels from the oils in the icing). Stir the color in all the way, adding more gel if necessary to reach the desired shade. You can find decorating bags at any craft store. I use the Wilton ones because I received them as a gift. I believe that the tip (silver thing that icing comes out of, for lack of a better description) is called a "Star" and it had the number "32" on the side. These are super cheap at the craft store. I think maybe $1 or so? Icing is easy...just point and squeeze in a circle around the cupcake! To store my cupcakes, I used this awesome storage piece from Martha Stewart's Macy's line. T's grandparents gave it to me for Christmas, and I am in looooooove! It has two enclosed storage areas, and the trays are removable AND you can turn the upside down to store a cake, cookies, etc. One of my favorite gifts, for sure! I think I did okay! Please let me know if you have any questions. I know these aren't professional looking (certainly not like Rhiannon's! ), but the crowd was pleased. Linking this post to Jen's Tasty Tuesday party at Balancing Beauty and Bedlam. Those look so yummy. My fave colors. I want to get into making cupcakes & cake decorating. Buttermilk??? Wow, I'll have to remember that! I love this tutorial. I think you did an excellent job. You could pass for a professional. And thanks for posting the tip on buttermilk. My grandma taught me this trick, but not many get to learn their grandmas' secrets. I was one of the lucky ones. The cupcakes look gorgeous! 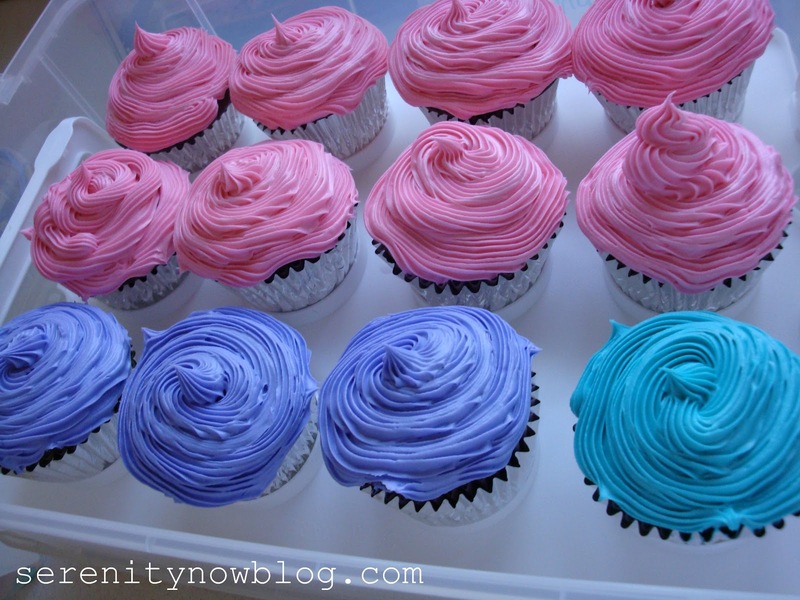 I have the Wilton cupcake decorating kit, but haven't tried to frost cupcakes with swirls like that. I tried it with the round tip and it turned out looking like something you wouldn't want to eat. LOL I'll have to try again! So fun! Thank you for the buttermilk tip too! Pretty, pretty cupcakes! Love them and I just made some coconut ones yesterday. I will definitely try this version of cupcakes. The buttermilk and extra eggs must make them incredibly moist. I'm also going to pick up a large tip because your cupcakes look great and you made it look so easy. My cupcake carrier is similar to yours except mine is Martha Stewart from Kmart. When people see it they oohh and ahhh over it. Your girls probably would be happy if cupcakes were a regular thing in the T house! Those look great! Thanks for the tutorial. YUMMY! I love knowing ways to dress up cake mixes! Thank you so much for telling us exactly what decorating tool you used for cupcakes. I started to pipe icing onto some cupcakes a couple of months ago, but all I have is a little "star" tip. It was very time-consuming and frankly not very pretty to pipe the icing this way. I've never really looked at all the cake-decorating stuff, but I'm going to get this icing tip. There's just something about a cupcake that kids love. Kids of all ages, in fact. Oooh, I can't wait to try the cupcake recipe...I LOVE cake decorating...although I am very much an amateur! Also...where are there tips for $1?...because I need some new ones but they seem really pricey around here! AHH!! So cute :) Love it. Why, WHY did I read this post at 11.44 pm? Great tips. I'll have to try the buttermilk and eggs next time I'm making cupcakes. I'm not a fan of canned frosting so I always make my own buttercream frosting and then end up making more because I eat most of it :). Hmmmm....maybe I should start using the canned! I had no idea about the buttermilk!!! Beautiful cupcakes :) Just came across your blog, so lovely! Oh, so yummy. LOVE the icing! Thanks for this step-by-step. There are few things better in the world than a pink cupcake. If they taste anything like they look they must've been crowd pleasers! There's this fantastic cupcake-only bakery near my hubby's work and I've been looking for a recipe that turns out similar to theirs (fairly dense but still really moist- there's probably a stick of butter per cupcake! )for a while. In your opinion, how is this recipe different than regular cake mix cupcakes? Fluffier? Denser? Love your blog. When are you doing another decorating dilemma day? In need of a few pointers! You are a genius. Love them and thanks for all the information! thanks for sharing!